2017 Book Excellence Awards Finalist! “Why did they kidnap me? I’m not rich. I don't have a lot of family to extort. I have certainly not been a police officer long enough to make any enemies. But instead of waking to the incessant ringing of my alarm clock back in my small city apartment, I awoke in the dirt. In the jungle. Naked. What is happening? Where are their demands? Then I found her; beautiful and graceful, without a mark to show for her life trapped here. Wherever here is. How did she survive in this jungle? In fact, how is she keeping me alive? 14 days now, she has hunted, caught, cooked and provided without ever saying a word. She has listened to everything I’ve said, but never responds. Is she in on it? Am I in some weird experiment, or is it all a dream? But it can’t be a dream, because I keep having terrible nightmares. About bright lights, and pain, and figures at my door, their voices in my head. Of jumping off cliffs, being eaten by monsters and hanging myself. How can you have such vivid nightmares inside a dream? 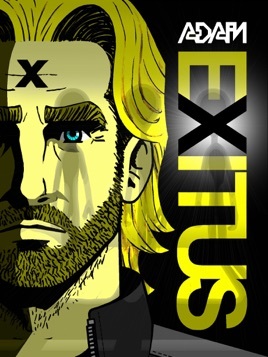 Adam Exitus is the debut novel by Australia’s most exciting new science-fiction voice, Nicholas Abdilla. It’s edited by award-winning author Chris Stead and published by Old Mate Media. It is also the first part of the Adam X series, a massive, immersive new universe in the tradition of epic space sagas like Star Wars, Hyperion, Imperial Radch, Bobiverse and Stranger Things and, and authors like Timothy Zahn, Kevin J. Anderson, James Luceno and Michael Anderle. Abdilla is also a passionate gamer, and was influenced by his favourite RPG series, Mass Effect. Filled with mystery, romance, kidnapping and an incredible twist, this could be the best science fiction book of 2017. Really enjoyed this book! Had never read this author before but will be again. Has it all. Horror, suspense, fantasy, humor,sorrow, even a little love. Highly recommend.